Advice on Writing Weblogs: A few weeks ago I came across this link to the article 10 Tips on Writing the Living Web by Mark Bernstein at A List Apart and just tossed it into my links collection to check out later. Today, while looking for good things to mention, I stumbled across the link again, so here we are. Now not all 10 of Mark's tips will apply to every writer, and some might not interest you, but at least one or maybe more of these tips ought to be helpful. Mainly, Mark tells you to be real, writing what you know and being honest about what you think. But you'll enjoy reading all 10 tips, so don't just take my summation as enough, read the whole thing. Palm OS Weblogging Update: Lastly, I've received a few requests of late about my journey with weblogging with a Palm OS device. I thought I'd present an update on that here. Essentially, nothing has changed. I've experimented with a few apps like Azure and several web browsers on both the Tungsten C and Dana Wireless, but found them all lacking. I don't want to run Java to do the Azure thing, but even worse, there's a 4k limit to posts in Azure. The same 4k limit and use of pop-up windows in Palm OS web browsers has also soured me on using them. Yeah, for short posts it's workable, but not ideal. Check out Michael Ashby's Weblogging With Your Palm post on the subject for more details. I have found that a document on the Mac synced via Wordsmith, Quickword or DocsTo Go seems to work best. And now that my Tungsten E has the new 32k Memo application and conduit, a Memo could work pretty well too. Alternately, using the "Send' key on my Dana Wireless while connected via USB cable works great -- I write remotely and then I just use the Send function dump raw blog text right into NetNewsWire's useful Weblog editing window. In fact, my big plan for a Palm OS blog tool, is contact Stand Alone Software about writing a dedicated application in the same vein as Hand/RSS for reading RSS feeds. I like that Stand Alone has considered both wired and un-wired customers with Hand/RSS, since feeds can be updated either via a net connection or their included Mac or Windows conduit. 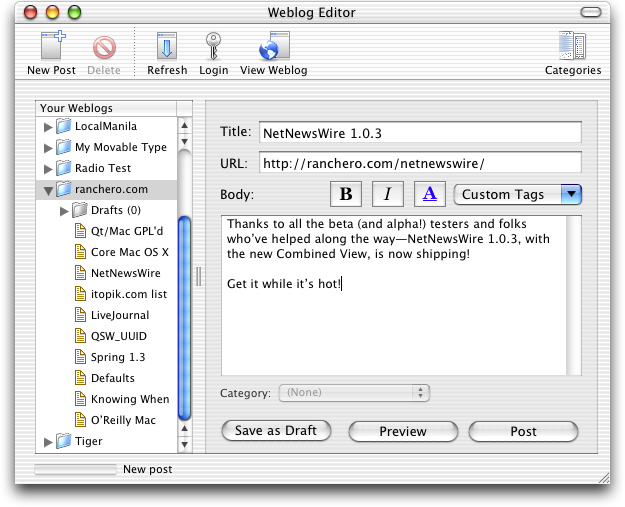 Seems like a perfect way to do a Weblogging tool to me.